Having built and owned since new for many happy years the existing owners are ready to hand over this meticulously maintained home to some new lucky owners. If you are looking for a modern, established yet manageable sized home in a prime location, then this home will tick all your boxes. It plays beautifully into the hands of those thinking of retirement or for busy families. On entrance you are greeted with the surprise of a stunning sark ceiling in the lounge which provides warmth and texture to the warm and inviting open plan living areas. Three bedrooms, two bathrooms, separate toilet, separate laundry, double garage and off-street parking. 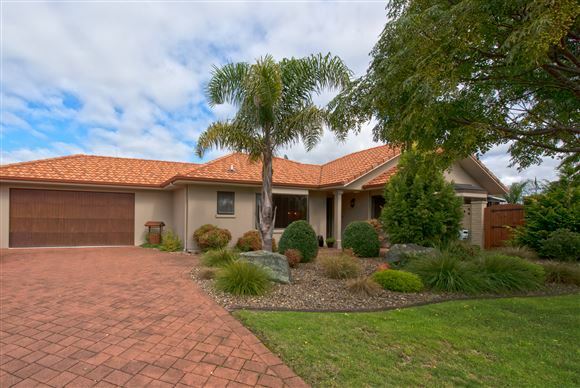 Sited on a sunny corner it is not overlooked and enjoys an open street outlook and views to the Papamoa Hills. The 449sqm section has been beautifully landscaped and features a gorgeous sheltered outdoor area with all day sun and a conservatory for the cooler months. At the rear of the section there is a garden shed and raised garden box for the green thumbs and a workbench in the double garage for the tinkerers. This is a sought after street in a desirable location close to the beach and it's only a short walk to the Plaza Shopping Centre, Fashion Island, library, doctors and the many reserves and walking/cycling tracks nearby. Auction (unless sold prior) - To be held at Harcourts Auction Rooms, 1 Third Avenue, Tauranga on Thursday 19th May 2016 at 2:00pm.